The regular season games are starting to wrap up (already?!?) and conference tournaments are starting to take shape. The ACC tournament is almost completely known while the Ivy and Patriot leagues are still very hazy. The ACC will see Notre Dame and North Carolina fighting this week for the chance to play Duke. The loser gets Syracuse. Syracuse will play one the only two teams they lost to while Duke hasn’t beaten anyone in the field. Last year’s tournament saw every team avenge a loss from earlier in the year. There’s no reason to think that the same thing can’t happen again here. The Patriot and Ivy leagues are also very confusing. If you took the top five teams in both leagues and shuffled them up into a big double elimination tournament….who wins? I still don’t think you have a clear-cut favorite in that group. This is why those automatic bids will be so valuable. At-large bids from those conferences will be hard to come by. Records and scores are including games from April 12. Maryland’s defense starting showing some kinks in their armor after weeks of dominance. First, they beat Loyola by a goal, then they won a nail biter over Rutgers. Matt Rambo scored the game winner with about 13 seconds left to keep the Terps on top of the polls. Notre Dame had a small ACC break and played an early week game against Marquette. They enjoyed a nice 14-7 win to keep their momentum going strong. A date with UNC is next which will decide the top seed in the ACC tournament. UNC got a huge win by holding off a late Syracuse rally and securing the win at home. The win avenges last year’s overtime thriller loss up in the Carrier Dome. Notre Dame will be a great matchup for the Tar Heels. Syracuse’s goalies struggled against the Tar Heels and Warren Hill saw his first significant playing time of the year. He played well, but I don’t think you’ll see a goalie controversy brewing. Kieren Burke also frustrated Orange shooters for a second straight year. Denver pummeled St. John’s 18-5. to improve to 3-0 in Big East play. There is still no question that this is Denver’s conference to lose. 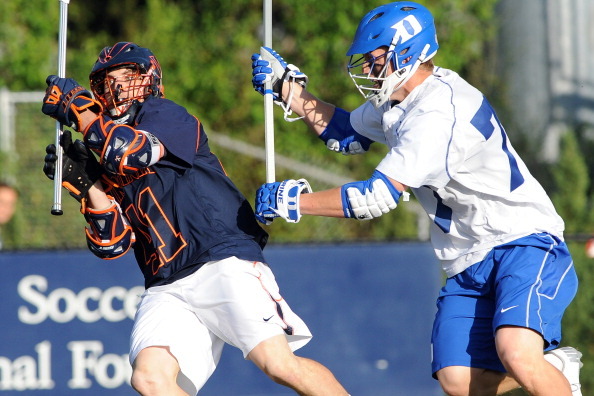 Duke finally got their first ACC win, topping UVA 15-8. This was a huge win for Duke and grants them a spot in the conference tournament. There aren’t huge post season implications for the Blue Devils now, but that tournament will be fun to watch to see how Duke responds to being a four seed. Yale scored a huge win over Brown 16-10. Not only did they hold Brown to just 10 goals, but their 16 ties for their second highest output of the season. Lyle Thompson’s effort against Binghamton tied him for the NCAA career points record. The degree to which Thompson will likely smash this record is astounding. Rob Pannell broke the record by a point. Before him, Matt Danowski won it by 10. They did it in 72 and 80 games respectively. Thompson is at 62 right now. Ohio State kept their B1G forward momentum going by topping rival Michigan 13-8. They are still undefeated in conference play. Stony Brook beat up on conference for UMass-Lowell and then lost by one to Lehigh. They mostly move up because of Army’s drop. A mid-week game with Duke is next. Cornell beat Canisius and Hofstra, which they really should have. Their next two games against Brown and Princeton will make or break this team. Virginia losing to Duke cast them out of the ACC tournament and into the consolation game for a second straight year. I almost feel sorry for Penn, who is getting one angry ACC team with no out of conference losses. Georgetown is next up though. The Patriot League random number generator gave Navy a three point win over Army this week. That is a little unfair to Navy. This is actually a pretty good team who has a decent resume put together over the season. They definitely need to use the conference tournament to lock an NCAA bid though. An early exit might be enough to doom them. Army is in a similar spot to Navy. They’re a great team, but they have no marquee wins and a few confusing losses. Colgate is up this this week. Towson continues to run their conference, sitting at 3-0 in conference play. They play in a lot of close games, but can make some noise in May if they get the chance. Speaking of running their conference, Richmond’s 20-9 blowout of High Point sent a huge message. This second year team has big goals in mind. Brown’s powerful offense has been slowing down as of late in Ivy league play. They once looked like they were in the driver’s seat, but a two game skid is starting to change my opinion of their post season potential. Georgetown secured a big win over Villanova. Something you may not know about Georgetown? They have only lost to ranked teams. All except Denver were pretty close too. Loyola’s back on the list after a win over Boston University. Still not living up to their early season expectations, they can make a strong push for the Patriot League championship. Princeton stopped their three game losing streak by beating up on Dartmouth. Games against Harvard and Cornell next will either list this team to their fullest potential or bury them under another disappointing season. Next five in consideration: Marist, Marquette, Fairfield, St. Joe’s, and Hobart.